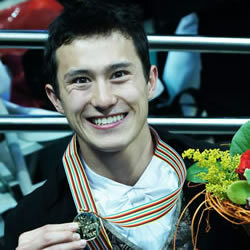 2018 Olympic gold medalist, Patrick Chan is a Canadian skating legend. Born in Ottawa, Patrick Chan has been figure skating since the age of five. Since then, he has won five consecutive national titles from 2008 to 2012. In 2011, he became the reigning World Champion (Moscow) establishing World Records in all 3 categories (short program, long program, and combined score), and in 2012 he re-established himself as the best male figure skater in the world with a second World Championship gold. In 2018 in Pyeongchang, Korea, Patrick competed in his last Olympic Games winning gold for Canada in the figure skating Team event.